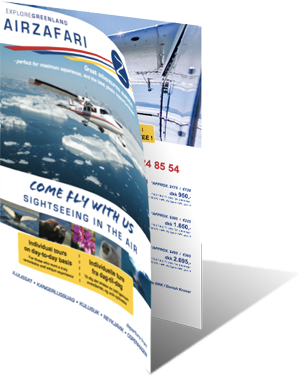 Book your flight in Narsarsuaq! Narsarsuaq is known for its grand transatlantic airport. Nestled in a deep valley and situated close the inland ice, which provides an environment with very dry air, good conditions for an airport. Thousands of planes crossing the Atlantic Ocean use Narsarsuaq Airport either as an enroute alternative or a midway fueling stop on their journey. Narsarsuaq is also historic, being the first Air Base built by the Americans, and just across the fjord in Qassiarsuk, the viking Erik the Red settled down, after he discovered the worlds biggest island and named it Greenland. Our flights from Narsarsuaq will bring you some of the best views Greenland has to offer. Here we have high mountains, numerous glaciers, and many cities and settlements close by. Personal tours can also be arranged! 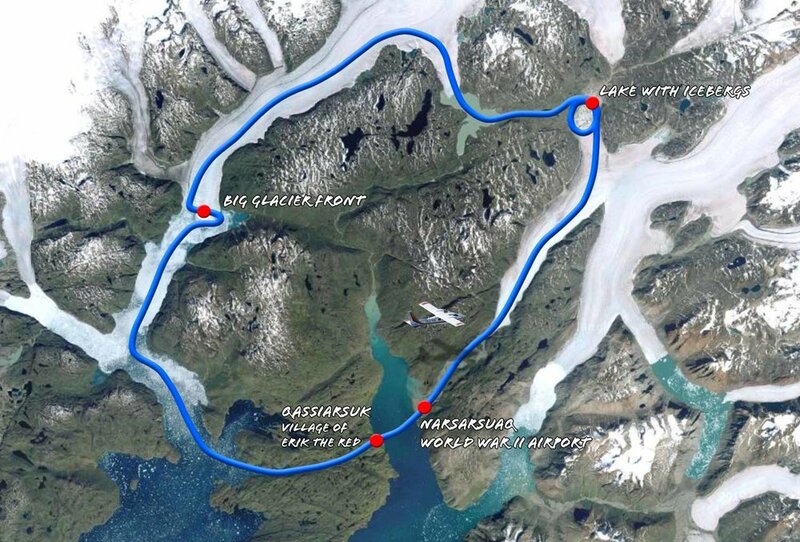 Join us on a spectacular sightseeing over Kiagtut Sermiat glacier, with its unique location right next to Narsarsuaq. We fly along the glacier continuing towards an iceberg filled lake known as "the hole", since it it rests at the of glaciers on three sides. Then we venture along the fjord systems and join an even larger glacier, where we make a few turns by the glacier front wall, a great photo opportunity! On the way back to the airport we take a closer look the historic village of Qassiarsuk, where viking Erik the Red settled down and named Greenland, as it is known today. Call (+299) 24 85 54 and speak directly to the pilot for more information or questions of any kind.